After a year of off and on only stitching the border around my Periodic Spiral quilt, I finally joined the ends the other day. 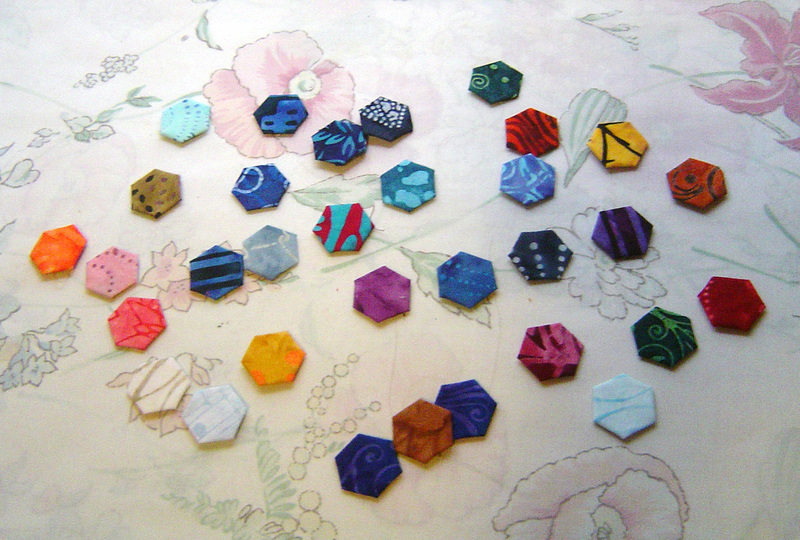 A couple of years ago, I started off on a journey of tiny hexagons, sewn around batik scraps collected by some of my guild members. I was inspired by an online “maybe it’s abandoned program” which no one from the program contacted me weather it was okay or not okay to talk about their website in a blog/podcast. 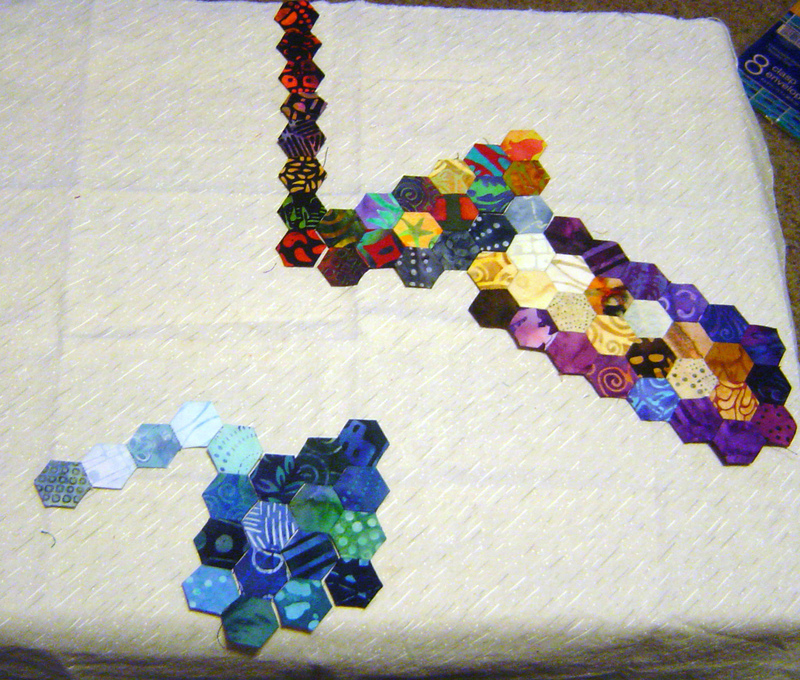 I mean the Periodic Sprial quilt from the diagram on the “Periodic Spiral website“. I have podcasted about it, blogged about it when deciding my trims, and then mentioned it again when showing some of the embroidery I did for it. I printed out the PDF from the website onto some Printed Treasures paper. And then I cut out the group names that I had previously embroidered. The previous photo was taken about a year ago. Last weekend, I arranged the periodic table group name labels close to the groups in question. 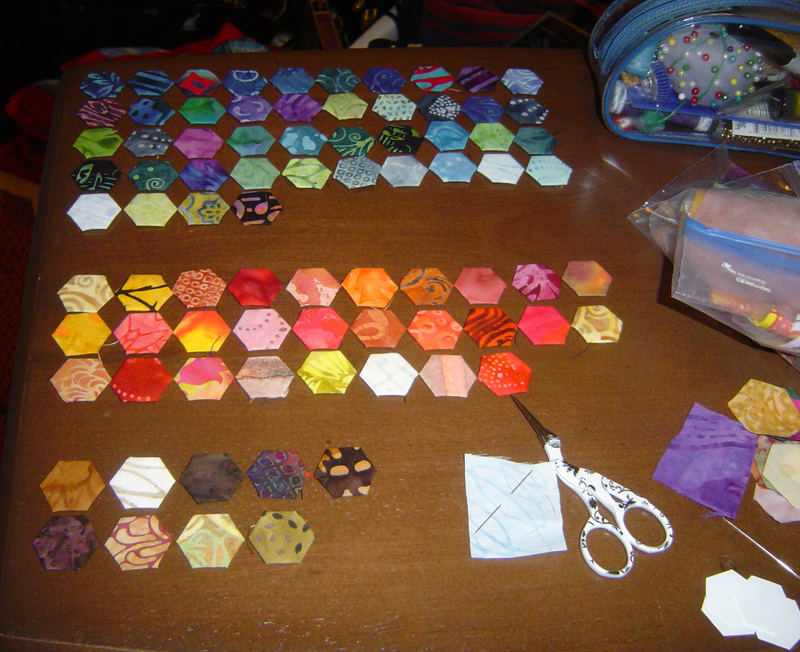 I am planning to outline each of these with trim of some sort (hasn’t been decided yet which trim). And then I am going to embroider a line from the name to the group area. 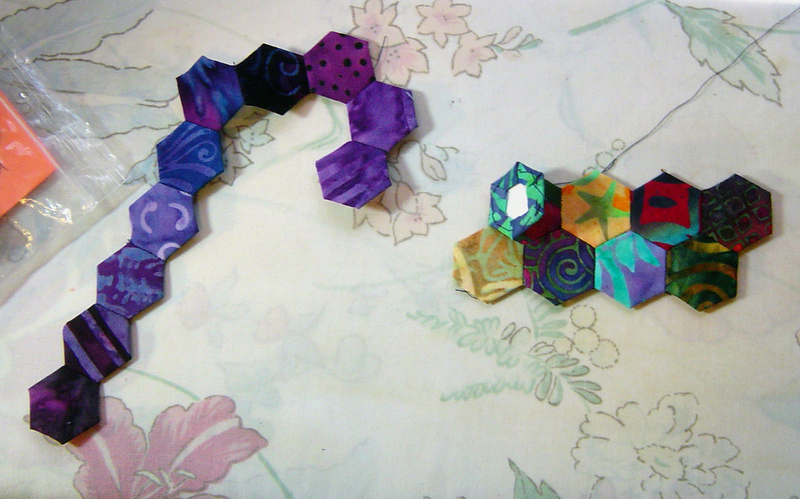 I remember making one mistake design element two years ago when setting up these hexies into blocks. I never separated non metals & metalloids, the traditional ‘staircase line’ that follows most versions of the periodic table. So I will have to embroider it in place. And have I shown you about the shiny fabric??? 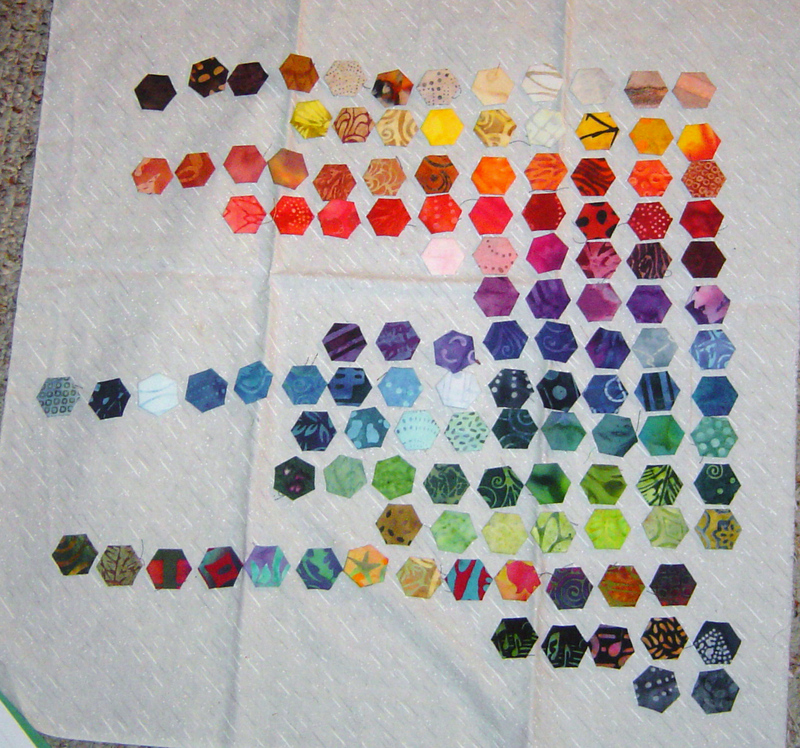 I had really prepared for this quilt last year, as the letters I made were cut out with fusible on black batik already. And then the shiny fabric was cut to make a perfect ‘border’ around the black fabric letters. So this year, I decided to transfer the previously cut and made letters onto the previously cut shiny fabric, after adding fusible webbing to the back of the shiny fabric strip for stability. I referenced the Tip Sheet for Metallic & Sheer fabrics for a rough idea on how to handle this. Although I currently don’t have it sewn down yet, I think this will be a nice idea. Really there so far, doesn’t seem to be much to it. A fusible webbing heat set onto the back of the fabric, one of those two sided ones that you have to peel off later. 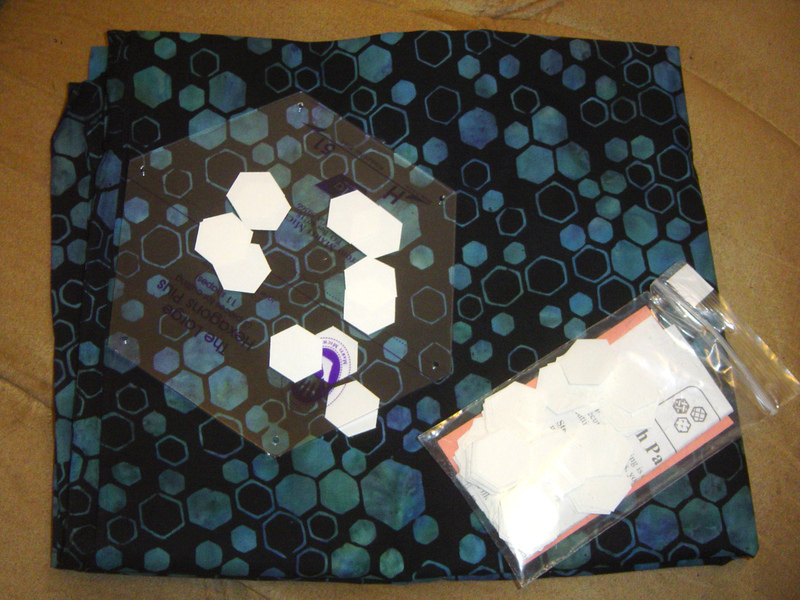 And then I have my applique pressing sheet to make sure it happens okay. I don’t use the pressing sheet often, but good for me for having it & using it. Now it is going on my wall, or rather on the front door to my sewing room, and I know I’ve been tempted by the lure of shiny fabrics in my past, but I’m not making the same mistake with this one. I made a pillow out of similar fabrics while in high school, yes it was shiny and cool feeling, but you woke up with face sparklies and for a few days didn’t know why. The shiny fabric above leers on the edge of “gaudy” or “tacky” but as a silver background, it pops out nice with the forground colors AND evokes all the METALS that can be found as natural elements. 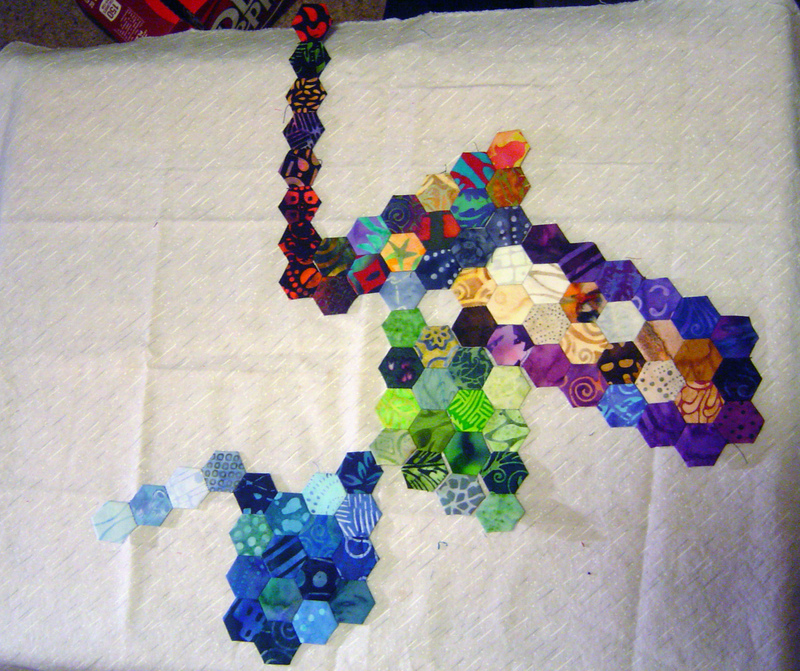 And so what’s probably next for this quilt is to get back out my box of trims (there are more than this) and decide what’s going around all the group names. 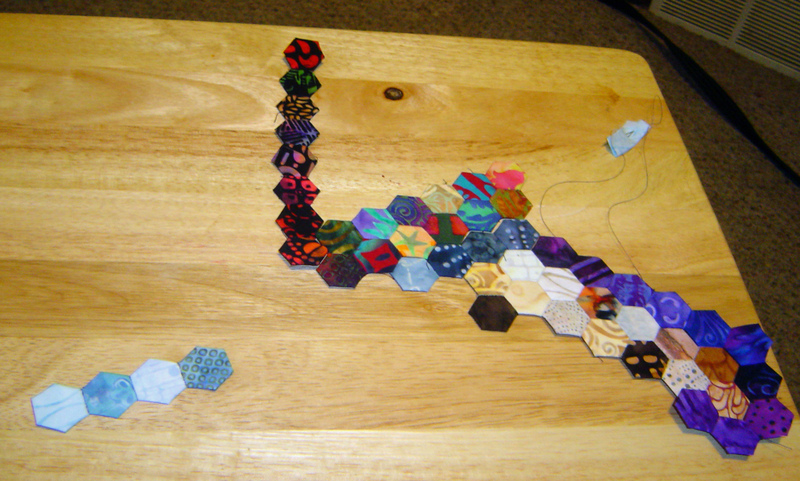 I still like the black braid outlined in white that I thought about using for the whole center outline, but I have to figure out where to use it that it will go, but not attract too much attention away from the hexagon ‘star’ middle of the quilt.